"I recently got a new camera (Sony RX100) with the option of recording AVCHD and MP4. I'm going to use iPhoto and iMovie to handle the video. So, should I use AVCHD or MP4? Does AVCHD work with iPhoto and iMovie? How much larger are the files than MP4? How much better is the video quality?" Shutterbugs are generally versed in recording videos, whether they are using Panasonic or Canon, but might be caught on the horns of a dilemma while choosing which video format to record in, AVCHD or MP4, two of the most popular video file formats for storing recorded videos. Accordingly, AVCHD vs MP4 becomes a hot topic among camcorder users. If you are curious about similarities and differences between AVCHD and MP4, this guide will shed some light on comparing AVCHD to MP4, with both pros and cons listed here. What is MP4: MP4, abbreviated for MPEG-4 Part 14 and occasionally known as MPEG-4 AVC, is a digital multimedia format used to store video and audio, as well as other data like subtitles and images. MP4 technology works by compressing the files, making the overall size much smaller, thus streaming over the internet is easy and videos are much more accessible and playable. What is AVCHD: AVCHD, short for Advanced Video Coding High Definition, is developed Sony and Panasonic collectively, which is originally designed for HD camcorders use for digital recording and HD video playback. It records video at a resolution, ranging from 720p to 1080p or higher. Videos in AVCHD format can be burnt to a standard DVD disc that can be playable on an HDTV and Blu-ray Disc player. Perhaps the rudimentary difference between AVCHD and MP4 files is the container format, though both recording video codec as MPEG-4 AVC/H.264. Generally, the AVCHD-formatted video uses .m2ts extension saved with the Picture Motion Browser (PMB) software, whereas MP4-formatted video uses .mp4 file extension saved with the PMB software. From a technical point of view, AVCHD differs greatly from MP4 with regard to the audio codecs that are used. The former uses MPEG-4 AVC /H.264 video codec and Dolby Digital AC-3 audio codec whereas the latter employs HEVC/MPEG-H Part 2/H.265, MPEG-2 Part 2, MPEG-4 ASP, H.264/MPEG-4 AVC, H.263, VC-1, Dirac, others. Sony and Panasonic capture their highest resolutions in AVCHD only. The format will record HD (1080i, 1080p and 720P) and SD videos. JVC captures MP4 all the way up to 1080p at 60 frames per second. Yes, mp4 is usually of lesser quality. So if quality is an asset, use AVCHD since it guarantees great image quality that impresses you each time. AVCHD has become very popular amongst consumers because of its high quality video image. But this usually leads to an over-large file size. Nevertheless, files in MP4 format are smaller in size but high in audio and video quality. For instance, a 30min 1920*1080 AVCHD footage usually takes up 300-400 MB while the file size of a MP4 video is commonly 100MB. Besides, as MP4 also support HEVC/H.265 codec, it can offer even smaller file size at the same quality than H.264. So if the file size is your prime concern, MP4 is undoubtedly the king in the AVCHD versus MP4 battle. 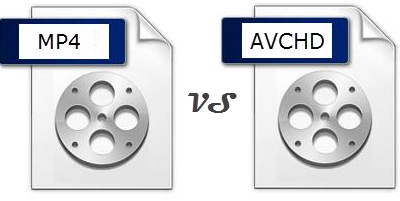 You will never ignore the compatibility factor in the AVCHD vs MP4 comparison. AVCHD file format is compatible with Blu-Ray Disc format, several recording media devices like hard disks or memory stick media, as well as xv.Color technology. MP4 files work well with Apple QuickTime format. And MP4 format is also famous for the flawless compatibility with various recording media and networks, including PlayStation Network video. When mentioning the usage, which one is better, AVCHD or MP4? Technically speaking, AVCHD is suitable for creating AVCHD and Blu-ray Disc recordings and watching on an HDTV. Whereas, MP4 can be saved as a single movie file and is much easier to move, copy, and upload and share personal videos or songs by web or hard disks. 1. Use AVCHD for better audio quality: AVCHD supports Dolby AC-3 encoding in addition to LPCM while the audio in MP4 is the compressed AAC format. While Dolby AC-3 is a compressed audio format, the LPCM is a lossless uncompressed audio format. PCM audio recordings are raw digital audio samples that use no form of compression, and therefore, the format has large size and also much better quality than the compressed AAC audio in MP4. So for audiophiles, AVCHD is a better format. 2. Use MP4 for higher bitrate: To note is that the total bitrate of AVCHD is limited (18 Mbit/s for DVD Media, 24 Mbit/s for other media and 28 Mbit/s for AVCHD 2.0). Bitrate will largely determine the video quality. If you want a higher bit rate that may go over the limit of AVCHD, select MP4. MP4 is designed as a distribution format for playback on mobiles and sharing online, and AVCHD is used by cameras to offer best quality for playback on HDTVs. The following table mainly showcases the tasks while you compare AVCHD with MP4. What concerns most to people is whether the AVCHD and MP4 videos can be easily played, edited and uploaded to YouTube or Facebook. AVCHD seems to be harsh in terms of video compatibility. As HD videos in AVCHD have up to six times the data of SD videos, processing AVCHD videos can be very slow on older processors. MP4, though being friendly with many platforms, might still have a screw loose with improper codec, bit rate, resolution, or so. To fix the AVCHD and MP4 format incompatibility, you can convert AVCHD/MP4 using a third-party program like MacX Video Converter Pro. Incorporated with 320+ video codecs and 50+ audio codecs, this software is able to convert AVCHD and MP4 from/to AVI, MOV, FLV, WMV, MPEG4, H264, MKV, etc and transcode AVCHD/MP4 and other videos to 350+ latest mobiles, including iPhone X/8/7/7 Plus/6S/6S Plus, iPad Pro, iPad Air 2, iPad Mini 4, Samsung Galaxy Note 9/S9, Sony Xperia, Surface Pro 5, PS4, etc. With support for Intel QSV, Nvidia Cuda and AMD hardware acceleration, it will transcode, compress, edit, trim AVCHD/MP4 or other files with No.1 fast speed and 98% quality reserved. Meanwhile, you don't need to worry about the heavy burden on comoputer memory and CPU usage.